The season has begun and as always it is a mix of our team members doing some group training rides (slams) on various terrain and of course starting to test their fitness in early season races. One of the rides that have a mix of road and gravel is the yearly Hell of Hunterdon. Andreas did this for the first time this year and had a great time. 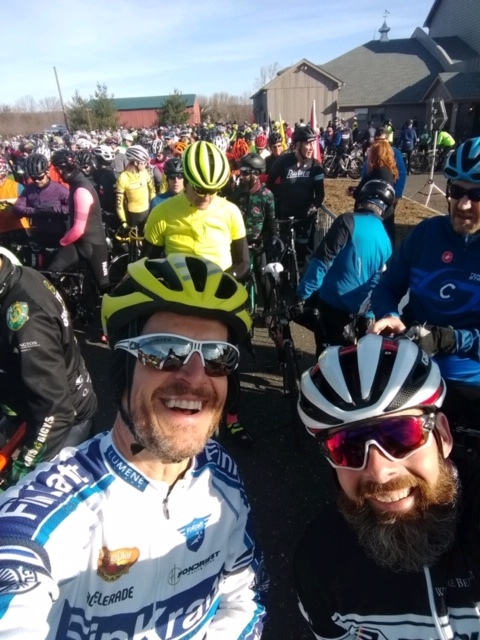 He rolled in first over the line in what he described as being a well-organized ride with variable and changeable terrain (82 miles with 5,000 feet of climbing, 15 miles of gravel sections). Attendance was substantial as about 900 riders showed up. Road races can only dream about such attendance these days. Beards , gravel and Craft Beers Rule.